Over the last week I’ve had many people contact me about my recommendations including some members of the House of Lords and a variety of other people both from the UK and abroad. It has been really great to be able to discuss and debate my Winston Churchill Memorial Trust Fellowship report recommendations with so many different people. Whilst this is just a first step, I’ll be making sure as best I can that the recommendations I have made in my report can be fed into the consultation as soon as it is released. It sounds like it might be a busy few weeks! Press Release: Living on a Railway Line, a major new UK report into child abuse and exploitation. “Professor Rowland’s work is the best advocacy I have ever known for safeguarding and protecting children. It is clear that Professor Rowland has put his heart into his research and that he truly cares about bringing impactful and positive outcomes for vulnerable children and families. …As the Chinese philosopher, Lao Tzu, said, “A journey of a thousand miles begins with a single step”. That journey has begun and Professor Rowland’s recommendations wilI now take on a life of their own – projects stemming from his recommendations will sustain themselves because they are done ‘In the Service of Children’”. Mrs Liew Sau Pheng, Founder of the Malaysian Child Resource Institute (MCRI). “This report provides a valuable consideration of a diverse range of challenges faced by professionals and members of the community when seeking to improve safeguarding of vulnerable children in the UK. By drawing on the insights gained from reviewing and observing practices in a wide range of international contexts this report offers a fresh perspective on these issues and the potential responses.” Lisa Harker, Director of Strategy Policy and Evidence at the National Society for the Prevention of Cruelty to Children (NSPCC). 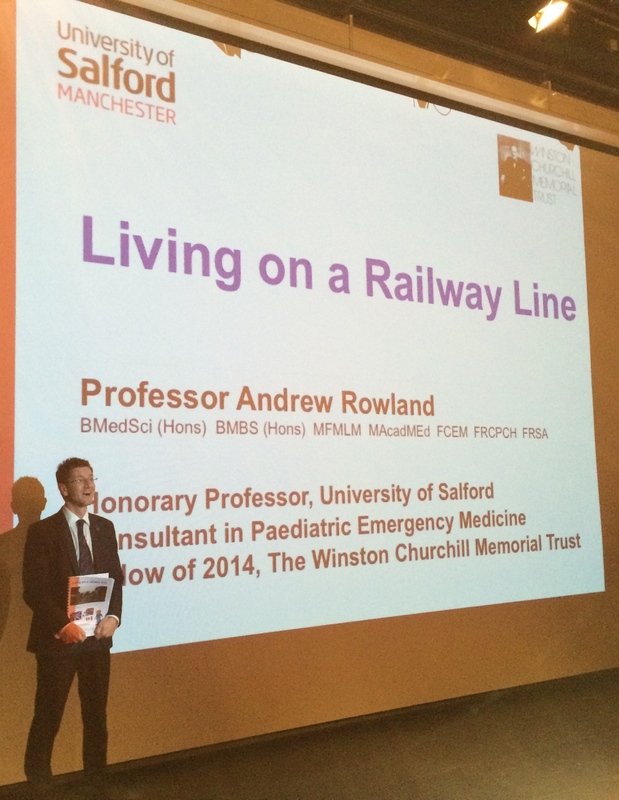 “Dr Rowland’s excellent report demonstrates the significant results that can come from a Winston Churchill Memorial Trust Travelling Fellowship. These Fellowships provide a unique opportunity for British citizens to travel overseas to bring back fresh ideas and new solutions in order to address many of the current social challenges facing the UK.” Jamie Balfour CBE DL, Director General of The Winston Churchill Memorial Trust (WCMT). “Barnardo’s welcomes this report and the evidence it draws together to gain a better understanding of what needs to change to ensure that vulnerable children are being safeguarded. Barnardo’s supports the recommendations relating to child sexual exploitation, particularly around changes to grooming legislation and the need to remove the term ‘child prostitute’ from our laws.” Barnardo’s, the UK’s leading children’s charity. “This is a timely, wide-ranging and comprehensive report on vital aspects of child safeguarding. Its recommendations are global in their reach, and pertinent to many jurisdictions, particularly the UK. For example, consistent high quality training in child abuse and neglect for all professionals who work with children and families should be the norm, and organisations involved in clinical research should indeed promote this more widely with patients and the public. We will take time to consider all the recommendations in order to determine how they can be best supported by the RCPCH and, where appropriate, implemented. This report is written with a sense of urgency and I urge others to read it, digest it and engage in active discussion on how safeguarding children in the UK and abroad can be improved.” Dr Geoff Debelle, Officer for Child Protection at the Royal College of Paediatrics and Child Health (RCPCH). “I welcome this important and timely report on child abuse and neglect. While recent high profile cases, of both a recent and historical nature, have raised public awareness of the very difficult lives many children lead, the findings and conclusions in Professor Rowland’s report highlight what can be achieved through the promotion of greater inter-agency and multi-professional co-operation and working, greater support and training for professionals and a more robust evidence base to inform policy and practice. I hope that the findings can further the debates and discussions about how we deal both nationally and internationally with the issue of the abuse and neglect of children and young people in all its forms.” Dr John Devaney MBE, Chair of the British Association for the Study and Prevention of Child Abuse and Neglect (BASPCAN). “We are delighted that one of our senior consultants in emergency medicine has been involved in such an important area of research. Professor Rowland has taken the opportunity to use his wealth of clinical experience and research to further explore ways we as healthcare professionals and multi-agencies, including those in emergency medicine, can improve the protection and safeguarding of vulnerable children. On behalf of the Trust we would like to congratulate Professor Rowland on this report and hope that it creates wider debate and work across health and social care at all levels.” Dr Gillian Fairfield, Chief Executive of The Pennine Acute Hospitals NHS Trust (PAHT). “Professor Rowland has identified so intuitively how, with a little effort but with an open mind, lessons from UK can benefit partners across the world and, significantly, how the UK can utilise successful models from international partners who work with far less resources. Working together in communities simply works. It is very apparent that we all have significant changes and urgent, yet lasting, improvements to make before we can safely claim to be protecting our children effectively. It is unique and motivating to see a senior health care professional display such an inclusive, holistic approach fully understanding of the need for all of us to step up our safeguarding strategies: as parents, families, child protection organisations, health care professionals, the judiciary and law enforcement. This report gives us clear evidence that it is everybody’s key role in life to protect children and we need to listen to and learn from successful strategies around the world, adapting and applying them to our own settings fast, before another child gets harmed. This crucial and opportune report highlights the importance of what many of us have forgotten. Effective safeguarding of children does not start with child protection experts or high level professionals working with child victims, it begins with empowering the children themselves: working closely with their parents, their families, their friends and neighbours, within the communities in which they belong, and in the places where they spend most of their time. These key, trusted community members are often in the best position to protect children from being harmed. If every community is alert and engaged in protecting their own children, offenders may continue to pursue, but they will meet far too many obstacles, and therefore will be less able to harm our children. It is by partnering and listening to the close community that really creates sustainable safe environments for children to grow up in, feeling safe, being protected, as they should be by adults, in any part of the world.” Maggie Eno MBE, Co-founder and Coordinator of M’Lop Tapang. “Professor Rowland’s in-depth and timely report starts by highlighting many issues that have, unfortunately, been raised in previous reports of child sexual abuse, both in individual cases and in cases involving multiple victims. The recommendations in his report are clear – we, as professionals caring for these vulnerable children and adolescents, need to act promptly, and move forwards in the training of recognition of those individuals who are at risk of, or who have already been subject to, sexual exploitation. APEM is in a unique position to be able to join with Colleges and other groups to work, in detail, on implementing Professor Rowland’s recommendations relating to training and to the urgent care setting.” Dr Julia Surridge, The Chair of The Association of Paediatric Emergency Medicine (APEM). “ChildSafe grew from the need for effective child protection in developing countries however its innovative multi-layered approach, including community based protection systems, resources for travellers and the business sector can be adapted to work just as well in the developed world, where the effectiveness of existing child protection initiatives is often called into question.” Sebastien Marot, Founder and Executive Director of Friends International. “This report is excellent and represents a substantial body of important work. There are some recommendations relating to Emergency Medicine which have merit and we look forward to working on these in due course.” Dr Clifford Mann, The President of the College of Emergency Medicine (CEM). Today, Monday 20 October 2014, sees the launch of a new report into how different countries tackle child abuse, in particular sexual exploitation, and how the UK can benefit from this learning. ‘Living on a railway line. Turning the tide of child abuse and exploitation in the UK and overseas: international lessons and evidence-based recommendations’ is a work by The Pennine Acute Hospitals NHS Trust’s Professor Andrew Rowland, in association with The Winston Churchill Memorial Trust and University of Salford. There are 10 key recommendations for the UK together with 25 associated and enabling recommendations and seven international recommendations. All of the recommendations are designed to build strong and healthy communities with children at their hearts. The launch coincides with the 25th anniversary of the signing of the UN Convention on the Rights of the Child. According to Professor Rowland’s report, a quarter of a century later there are still laws, policies and procedures in the UK and internationally which fall way short of properly protecting children. Professor Rowland gathered evidence from USA (Texas, Arizona, Pennsylvania, Colorado), Singapore, Malaysia (Kuala Lumpur, Ipoh) and Cambodia (Sihanoukville). He investigated the impact of mandatory reporting of child abuse, the work of children’s advocacy centres and learned about strategies used to identify children at risk of child sexual exploitation and trafficking. He uses his international experiences to make recommendations for the UK and the international community. The work contains over 300 scientific and other references. 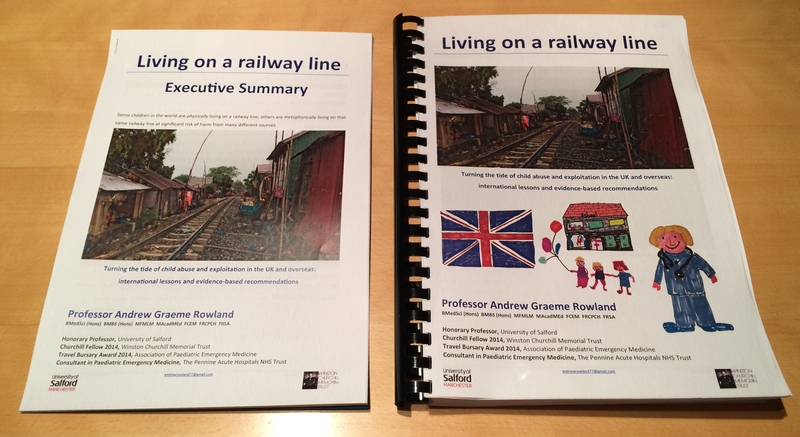 The report’s title ‘Living on a Railway Line’ comes from Professor Rowland’s experience in Cambodia, where children and their families are literally living beside train tracks. This dangerous environment, where one is never sure when or from where harm is coming next, is a metaphor for what many people experience world-wide, including in the UK, through their exposure to abuse. The ‘book’ is finished! Publication and launch of Living on a Railway Line at MediaCityUK on Monday 20 October 2014. 78890 words, 326 pages, 317 references and 75 figures later: the ‘book’ is finished! 35043 miles flown, 10 weeks away from home in a project spanning over a year, eight different cities, five different mobile phone SIM cards and one CT scan later, ‘Living on a Railway Line’ is now ready for publication and launch at MediaCityUK on Monday 20 October 2014 at 10:30am. Home to major BBC and ITV departments, the University of Salford and over 80 businesses across the creative and digital sectors, MediaCityUK is recognised as one of the most innovative developments in the UK. A report that was initially envisaged to be 15000 words long and a maximum of 30 pages has turned into a major new publication looking at the state of the UK’s child protection system and what we can do to prevent further tragedies in society, wherever that might be, to make the communities in which children grow up better and safer places for them to prosper in the future. The launch of ‘Living on a Railway Line’ coincides with the 25th anniversary of the signing of the UN Convention on the Rights of the Child. The report highlights that a quarter of a century later there are still laws, policies and procedures in the UK and internationally which fall way short of properly protecting children. The report’s title ‘Living on a Railway Line’ comes from my experience in Cambodia, where children and their families are literally living beside train tracks. This dangerous environment, where one is never sure when or from where harm is coming next, is a metaphor for what many people experience world-wide through their exposure to abuse. It is time to turn the tide of child abuse and exploitation in the UK and overseas. ‘Living on a Railway Line’ is a start, bringing together international lessons and evidence-based recommendations for the UK and overseas. After an introduction at 10:30am on Monday 20 October 2014 I’ll be launching my report and revealing my Top Ten Recommendations for the UK after which there will be a panel discussion, lunch and an afternoon workshop for attendees to agree on the next steps. So far over 100 people have confirmed they are attending the launch – invites have gone out from the University far and wide to a whole host of professionals who work with families and children either in the voluntary or state sector, as well as to Members of Parliament and members of the House of Lords. It is of the utmost importance that we recognise that the majority of child abuse and neglect in the UK occurs within homes, families and communities. The report that will be launched next Monday contains 10 key recommendations for the UK together with 25 associated and enabling recommendations and seven international recommendations. All of these are designed to build strong and healthy communities with children at their hearts. So, now that the report is finalised, I’ve got just under a week to write my launch presentation… I’d better get to it! You can contact me and see my biography online.